Tony Hawk’s Pro Skater 5 was delisted on PlayStation 3 and PlayStation 4 in North America sometime in February of 2018. As of this writing, the game remains available to download on PlayStation 3 in Europe and Australia and is on sale digitally worldwide for Xbox 360 and Xbox One. It is assumed that once the sale period ends the game will soon be delisted on Xbox platforms as well. Despite reports in February 2018 that the game’s online servers had been permanently shut down, Activision Support tweeted on March 2nd that they were aware of and working to fix matchmaking and online sessions, at least in the PlayStation 4 version of the game. A support FAQ link provided by the Twitter account suggests that anyone who wants to play the game offline would need to disconnect their console from the internet. The amount of content available in this forced offline mode is limited to the THPS5 levels the game shipped with and new Create-A-Park levels that are saved locally. Player and Community created levels are stored online and so will not be available to play offline or once the game’s servers are officially retired. 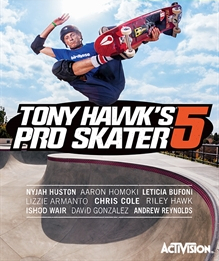 Tony Hawk’s’ Pro Skater™ 5 offers a fresh take on combo-driven skateboarding, the most advanced Pro Skater online multiplayer experience, and a state-of-the-art skatepark builder. Ride, build, and repeat! Pull off signature Pro Skater moves and extended trick combinations. Tony Hawk’s® Pro Skater™ 5 offers an epic mix of classic THPS action with combo-driven skateboarding and a state-of-the-art skatepark builder. Ride, build, and repeat! Create the sickest skateparks using over 250 obstacles or personalize existing parks in the course creator to add your own style. Thanks to an anonymous reader for submitting this game to the site.